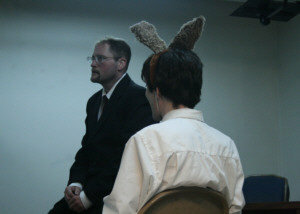 plays - Greg Aldrich - Playwright, Director, Actor. Greg Aldrich - Playwright, Director, Actor. A four act adaptation of the Dostoevsky's famous novel The Idiot, this play retells the stories of a menagerie of characters of as their lives come into contact with the virtuous Prince Myshkin and his desperate attempt to do good in a world obsessed with worldly values. On a frigid Alaskan night, Vivian leads her recently dumped best friend Clara to an eccentric loner’s cabin to confront him about the untimely death of her sister 7 years in the past. In one ninety minute scene, Vivian plays a cat and mouse game of identity and morality until she must play judge and jury against that man who has directly or indirectly ruined the lives of her entire family. DEVEN, a lowly editor, has always dreamed of a writing career and a steady home life: exactly the life his best friend TRISTAN possesses. When Tristan decides to throw all his achievements aside so he can pursue an old flame, Deven decides to steal Tristan’s life—their friendship be damned. The Moment After dramatizes a world where Schrödinger’s Cat and Spooky Quantum physics explore the choices that lay between and after the various moments that define our lives. 12 year old AEGISTHUS recounts the gory details to his ascent to power in this re-imagining of the Thyestes/Atreus story retold in a mythic-corporate present. in preparation for her nuptials, ALAXANRA visits the house of her Aunts to atone for a crime she committed as a child. there her relationship is put into the testing fires by AUNT MAEVE's challenge of love. will she succeed in her devotions toward EDVARD or will time and trial tear them in two? The Principle of the Thing is a mosaic chronicling the lives of several individuals as they face the battles of the everyday, trying to hold their lives and themselves together through a myriad of obstacles that mount like a sandstorm. two ex-cons TRUCK and RAT swore they would never see each other again after committing their last score and vowing to go straight. now, two years after the fact, TRUCK is finally getting his life back together, getting clean and recovering his son SAM from his ex-wife. but one night RAT arrives on TRUCK's doorstep, his face full of glass, looking for a place to hide out. is someone or something really after him or is it all just a ploy? suspicion and suspense guide these two into a night of illusion and recovery. a newly conceived adaptation of Dracula taken from the vantage point of RENFIELD in his relationship with DR. SEWARD. Utilizing doubling, the story researches Renfield's turn into the dark with his service to DRACULA and his eventual salvation when he battles his dark master for his soul. Typing Lear is a fast-paced, satirical comic adventure revolving around the trials and tribulations of three office employees forced by their megalomaniacal boss to type Shakespeare's King Lear to definitively prove that they are not monkeys and save their pitiful postions in the office. Love, duty, rivalry and the finite understanding of our position in the infinite universe come to a head in this outlandish post-absurdist comedy. the PRESIDENT believes the oval office is under invasion by insects and sets aside his other projects to investigate. The VICE-PRESIDENT and his AIDE hatch a plan to secure the prosperity of the country as well as their own: murder! A re-imagining of Stephen Crane's short story. Things at get dicey at the Blue Hotel when a Swedish guy arrives into Rompers, Nebraska, starts causing trouble and is murdered. But was it all his fault? A re-imagining of R.L. Stevenson's short story. The tale of a prominent medical student who has fallen into disrepair because of a failing conscience and regret over some supernatural events as the result of his unholy acts. Leah has nightly been reliving the best moments from her relationship with Curt, until she decides she’s had enough of this rehashing of the past. Poised to forget him entirely, she forces the memory of her former lover to fight for his existence in her brain and heart. They explore poetic worlds in order to investigate the nature of loss and hope and the value of a memory once its tangible equivalent is gone. Tony has just scored the sweetest apartment with his best friend Dave in the city of his dreams, but the new roommate, Rob, is less ideal. A pathological slob, Rob threatens to destroy what could potentially be the sweetest experience of the young friends’ lives. Matters are complicated when Dave’s girlfriend Maria arrives to the city expecting the worst aftershocks from their long distance relationship. Mistaken identities and misunderstandings pepper this play about the value of understanding with the various people in one comes across in life. A meta-theatrical reimagining of Gogol's The Nose, this play invesitgates the principles of adaptation as three theatre artists attempt to produce Greg Aldrich's latest adaptation to an unwitting stage. A ghost as appeared on the streets of an important Russian city and is stealing everyone's coats in the dead of winter! Government official, Stepan Varlamitch must figure out the mystery of the ghost before it wrecks havoc upon his city. Based loosely on Gogol's The Overcoat. Augustus and Jessie meet spontaneously at an aquarium and there's some spark there...but will the revelations about their lives allow them to come together or find their true identities?